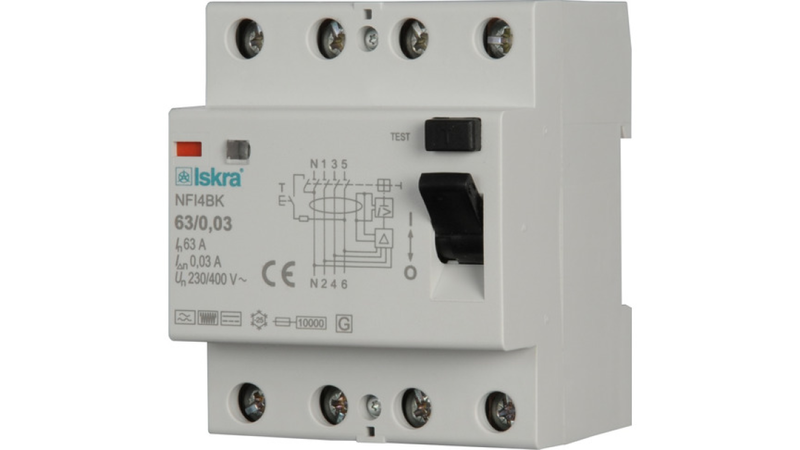 ISKRA NFIB are type B residual current circuit breakers (RCCB) for which tripping is ensured as for type A and in addition for smooth d.c. residual currents, residual d.c. currents which may result from rectifying circuits and high frequency a.c. residual currents. The type B residual current circuit breakers are not intended for use in d.c. systems and networks with operating frequencies other than 50 or 60 Hz. For type B tripping conditions for frequencies up to 1 kHz are defined. Functions of detection, evaluation and interruption for type A residual currents do not depend on the line voltage. For evaluation of smooth d.c. residual currents supply voltage greater than 50 V is required which can be applied to any two poles only. Surge current withstand capability with current waveform 8/20 µs is 3 kA. When designing and installing electrical installations, electrical loads that can generate d.c. residual currents in the event of fault, must be assigned a separate electrical circuit.